Classical Conversations is an organization that helps train parents to provide their children with a Christian, classical education. There is a large network of communities that meet weekly during the school year, in 35 states and 5 countries. Founded by Leigh Bortins in 1997, the program has grown from 11 students to over 36,000. The curriculum covers history/timeline, Bible, English grammar, Latin, science, geography, and math. They have recently released their Prescripts series, including 4 handwriting books, designed to coordinate with their curriculum and reinforce memory work. The books combine cursive writing with art instruction, and encourage students to be more artistic in their writing, and make it easy for homeschoolers to integrate art instruction into their homeschool day. 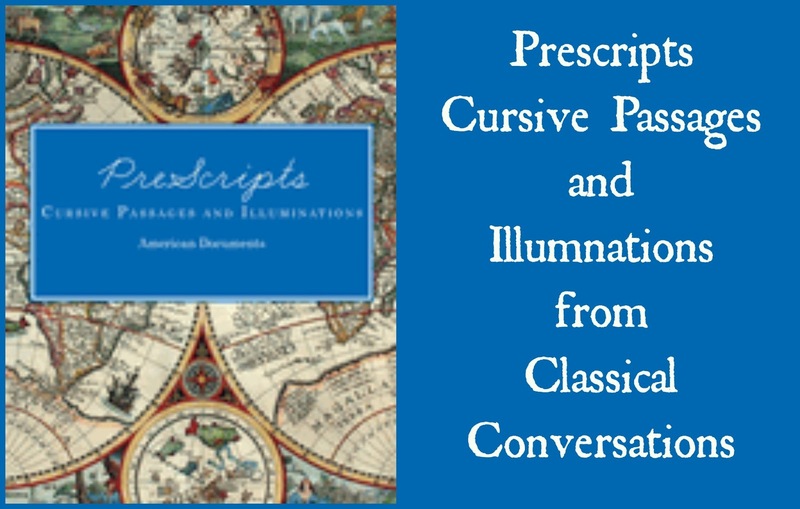 For the purpose of this review, we received the Prescripts Cursive Passages and Illuminations book, intended for ages 9 and up (click here for a PDF sample). It's a nice, spiral-bound book, which allows the student to open it flat and work comfortably. If a student were working on cursive mastery, they could trace over the cursive lettering in the book. Otherwise, they can copy the passages into their own notebook. The copywork passages are taken from Classical Conversations' Words Aptly Spoken: American Documents book, which is a supplement to their Cycle 3. There are 67 lessons in the book, each with one page of copywork and one illuminated letter to draw. If you were to assign one page per day, you'd have plenty of work for your school year, working 4-5 days per week. The art lessons in this book are centered around illumination, such as you might see in Medieval manuscripts. The students can copy the illuminated letters in the space provided in their copybook, or draw them onto their own sheet of paper. The illuminated letters require attention to detail, and assume some drawing skills, I would think. I confess, I'm a little confused why illumination was the choice for art in a book of copywork taken from American history documents, but they are lovely, and there is some good information about the art of illumination and suggested resources for further research on the topic if students would like to pursue it. I gave the book to my daughter Abbie, who is 12. She loves to draw, and doesn't mind copywork. She chose to write the passages in a separate notebook, and drew the illuminated letters in the Passages book. These are lovely copybooks. I am an instant fan of anything that puts copywork all together in one place! Also, having art lessons that are easily available for children to do in the same book is VERY convenient. I am guilty of letting art instruction fall by the wayside, because I'm not all that comfortable with it and there always seems to be something "more important" to do. The Prescripts series teaches cursive writing; children will not learn printing. The first three books in the series are consumable; the fourth can be used either as a consumable or non-consumable book. The first and third books in the series relate to the Classical Acts & Facts history cards from Classical Conversations' Cycle 2, which covers medieval to modern history; however, they are not necessary to use the books.